Financial planner and investment advisor Michael Kitces understands a lot about many areas of money and finance. He has been to school. He has twice as many letters after his name as he has in his name. Literally. Surprisingly, Kitces does not understand some basic fundamentals of the Bank On Yourself strategy for personal finance. Kitces wrote a review of the Bank On Yourself concept. And while he got some of the fundamentals right, he missed some very important points. From time to time, readers ask us about Kitces’ article, so I want to clear up the misconceptions in it. I’ll cover four things he got right about the Bank On Yourself strategy, then I’ll reveal the things Kitces got wrong—including five fundamental concepts. Well stated! You can’t take out a life insurance policy loan unless you have a life insurance policy with enough cash value to serve as collateral for the loan. And the interest charged for policy loans is generally at competitive, below-market rates. Here, Kitces is saying the way life insurance policy loans work allows your cash value to keep growing when you take a loan, so that total growth doesn’t lose as much as it otherwise would. He’s partially correct. However, we’ll show you (and Mr. Kitces) why, with a true Bank On Yourself-type policy loan, growth of your cash value does not slow at all! Michael Kitces grasps that you can borrow against your cash value and your policy continues growing. But he missed the feature with a really weird name that keeps the growth of your cash from slowing down at all when you take out a life insurance policy loan! More on that coming up. Thank you, Michael Kitces! We do appreciate your acknowledgement that Bank On Yourself is, indeed, a legitimate financial strategy. While that is true, by his line of reasoning, you shouldn’t take out a home mortgage because if you never repay it, eventually the loan could be called and you could lose your home. “Logic” like that isn’t particularly helpful, is it? I believe it should be no surprise that there are almost always bad consequences when you don’t repay a debt you legally owe. For example, did you know that if you negotiate forgiveness of all or even part of your credit card balance, you will owe income tax on the portion of your debt that’s forgiven? The IRS considers it income to you! I commend Kitces for what he got right. He clearly understands that being able to borrow against your life insurance policy “at favorable interest rates” is one of the living benefits of permanent life insurance policies. But while he understands this, he doesn’t seem to appreciate it. Understanding and appreciating are two different things, and that’s where Kitces’ critique comes up short. Perhaps he doesn’t appreciate the powerful advantages of a life insurance policy loan because Michael Kitces got five key fundamentals wrong in his Bank On Yourself review. I’ll reveal exactly what they are, shortly. That’s enough to make me wonder if he ever read my New York Times best-selling book, The Bank On Yourself Revolution or reviewed the Bank On Yourself website. You don’t even need to buy my book to understand how the Bank On Yourself concept works. 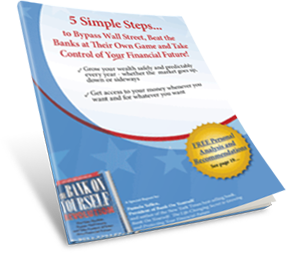 You can download my FREE Report, 5 Simple Steps to Bypass Wall Street, Fire Your Banker, and Take Control of Your Financial Future, right here. Michael Kitces doesn’t get to write a review of the Bank On Yourself concept and redefine my phrase, “Bank On Yourself,” however he chooses, just to fit his interpretation of how the concept works. That’s like making a Cobb salad (named after Robert Cobb, the restaurant owner who created it in the 1930s) with eggplant instead of eggs and claiming it’s still a Cobb salad. Ten times Kitces said a life insurance loan is nothing more than a personal loan using cash value as collateral. He repeats this over and over again like a chant, as though if he says it enough times, you’ll believe it to be the gospel truth. Kitces is correct that a life insurance loan is essentially a personal loan, using your cash value as collateral. But that’s like saying the Mona Lisa is really nothing more than paint on a piece of stretched canvas. It is precisely because your cash value is being used as collateral that a life insurance policy loan using the right kind of policy as collateral is the best way to finance a major purchase. That is a monumental oversimplification! On your own, would you know how to make your money grow every year by a larger dollar amount—guaranteed—regardless of what’s happening in the market or the economy? Would you know how to make your money continue growing even when you’re using it? For example, if you have $100,000 of cash value and take a $50,000 loan against your cash value, you will receive the $50,000 loan and still have the $100,000 cash value earning the same growth as if you hadn’t borrowed a penny—if your policy is designed in the true Bank On Yourself way. What financial vehicle gives you that advantage, other than life insurance policy loans? Let me ask you this: If you, the policy owner, can access your cash value whenever and however you want to, how can Michael Kitces be correct when he says “the life insurance company controls the cash value”? Aren’t you clearly in control of your cash value? In part 2 of this article, “Mr. Kitces – This Is How Life Insurance Policy Loans Work,” I’ll show you how Mr. Kitces misunderstood—or simply missed—each of these five requirements for banking on yourself, and why it’s so important that you understand them, in order to receive all the benefits available to you when you Bank On Yourself. The ability to take a loan against your policy (although in reality it isn’t “against” your policy) is arguably the primary advantage of the concept as a whole, because few things are more invigorating, financially speaking, than paying yourself back for a loan you took out. But an equally valuable attribute is that you don’t have to qualify for the funds. It is ultra-convenient to go to your insurance company’s website, click a few times to request a loan, and know that the funds will definitely be available to you in a few days. And while it is certainly advisable to pay the loan back over time, so that your policy’s cash value growth can continue uninterrupted, it is comforting to know that you’re not a specific deadline to pay it back. In our situation, we skip making loan payments on our policy in June and July because my wife, a teacher, doesn’t get a paycheck during those two summer months. The use of the cash value in the policy is the ultimate in self-sustaining finance. And like many others who own these policies, I can’t understand why more people don’t utilize this type of policy and why so many alleged personal finance experts are against whole life insurance in general. It’s equivalent to having a revolver. Um, let me explain that for the laymen who might think I’m talking about a handgun! In finance, a “revolver” is a revolving line of credit, where you can take out money, repay it whenever you like, interest accumulates and is added to principal (no minimum payment) and as long as you are under the credit limit (in this case your insurance policy cash value) you can pay it back on your own schedule. Corporations and businesses almost *always* have revolvers. Most individuals don’t. Everyone should have a revolver, as they are great for emergency liquidity; they mean you don’t have to keep (as much of) an emergency fund in cash. The key thing about a revolver is of course the interest rate: a revolver with 18% interest rates would be terrible, one with 8% interest rates would be better, while one with 4.5% interest rates would be pretty good, and big corporations can get 0.25% interest rates. There are other ways to get a revolver with decent interest rates. They all involve putting up collateral. There is a question of what collateral you are comfortable risking. And where you want your collateral invested. Using life insurance as collateral means you are using very conservatively invested collateral, but with a better rate of return than CDs. If you have common stock in a company you consider highly reliable, which you expect to go up, and you use that as collateral for a low-interest-rate loan, you will end up getting approximately the same results during your life (the value of your stock goes up, you can borrow against it to spend money, the taxes are deferred indefinitely), and similar upon death (subject to estate tax, income tax never gets paid by anyone). If you do have to sell you get a better tax rate (capital gains rather than ordinary). And you will probably get a better loan rate. But you have to have done extensive investment research (i.e. knowing what a sound common stock *is*) to do this, which most people never do. I only recommend stocks for people who actually enjoy reading 300 pages of financial statements for entertainment (which I personally do). What will the value of a Policy be if we have Zimbabwe type inflation (which is very likely). I’m looking at a 300K single premium, whole life policy. At my death, will the proceeds “buy a loaf of bread”. I’m looking at a $50 Trillion Zimbabwe note drawn on the Federal Bank of Zimbabwe on my wall. Several years back I bought 10 each of these 50T notes for $1 US. The beauty of the Bank on Yourself plan as that you can use “YOUR” bank to finance houses, land, gold and resource stocks all long the way. If you pay straight out cash, you will lose the 4–5% that you could earn in interest on that money so when you take out a loan from “YOUR” bank at 4-5 % it is at break even BUT the rest of your policy continues to grow and compound even though you are currently using your money elsewhere as a Hedge against Zimbabwe type inflation. Great idea. There IS always that chance. I have been thinking that since the 80’s so I keep a large portion diversified into other categories and use my policy to do it. I have had the same thoughts as Ben. I’m 61 & the cost of a $250k for me is probably $200 a month now & continuing to rise. How do I justify that cost on top of the interest to borrow it back or if I deposit a one time premium of $200k will I not have any monthly payments? Correct – if you take out a lump-sum policy, you would not need to make monthly payments. However, if you took out a policy with a monthly premium, and you truly couldn’t afford to take a policy loan knowing you’d be repaying that along with any premium, you should not take the loan. Think of it this way: You wouldn’t stop funding a 401(k) if you took out a car loan, and if it did mean you couldn’t afford to do both, then you really couldn’t afford to buy that car. Very interesting. Certainly, Bank on Yourself is something everyone should be a part of. Have boy policy , but not to sure about the term life part of it being that iam 52 and the term life rider ends once I reach 60.Question what’s the next if I don’t die before 60 and term rider goes up to 3,000 dollars orr so monthly? Well, with inflation, interest rates typically go up as well. Although it may lag, your policy ‘dividend’ will likely begin to increase as well. Just look at historical dividend rates back in the late 70’s and early 80’s. Policy dividends were considerably higher than they are now. What else was higher back then? Inflation. And keep in mind we really have NO clue what will actually happen, except that it probably won’t be what you expected! Bank On Yourself has survived and even thrived for over 160 years in virtually every economic situation. Feel free to discuss this with the Bank On Yourself Authorized Advisor we referred you to. If you need their name and contact information, please email your full name and state to info@bankonyourself.com, and my team will send it to you. Same here Jim. I will be turning 50 in 6 months. If I knew then, what I know now. I would be more financially stable and would not have to work 2 jobs to plan for a decent retirement. I thank God a co-worker told me about Bank on Yourself book. Never too late to learn. Without question the ability to have access to your money with no questions asked and yet have that money continue to earn dividends as if you never used it is a 8th Wonder of the World. A miracle! My only regret to learning about this late in life. If only I had known this in my 20’s. I would be so much better off! I was so excited by the BOY concept I have opened 4 policies! It’s the best thing that has happened to me financially. This is as close to a no brainer there is. Try it. You will not regret doing so. Simple! I need 15000$ for a new piece of equipment, took out a loan(1email), started to pay back, but had 2 slow months-skipped 2 payments-1 email each! No worries! Mr Kitces totally missed it. He should have talked to people who already owns the policy, like myself, and had proved it really works as you describe. Mr Kitces STOP with FAKE news! I’m looking at this with an open mind.The way things are in the world today everybodys trying to get your money.I even have to take a good hard look at Wall Street to determine if we haven’t been brainwashed to think it’s a no brainer to invest in the market, because that’s what every financial advisor tells you to do, all the while making commissions on your money whether the market goes up or down. The market is only flush because of all the money printing from the Fed & BIG Corps buying back their own stock with very cheap money from the banks. Equities are not the way to go. I have the policy, but really didn’t understand the borrowing policy. I am 67 and come from a family whose uncle is a whole life insurance regional for a top five company. I never took his advice and kept seeing my bank accounts dwindle through fees, charges, and services, not to mention the 5 hours to get a bank account membership. It will be more time if I take out a loan or even change accounts and a major sit down if I withdraw. This is strong arming and bully banking. I have had it! I need an account of whole life like BOY and still have the freedom to withdraw for expenses and deposit my SS. I am consolidating my bank accounts and go to Boy. Fees are the worst! I refuse to pay banking fees. It turns out the only way to have a normal bank account and not pay banking fees is to (a) find a really old-fashioned bank (none of the big banks will treat you right) and (b) put a large CD deposit in, to (c) get access to their “no fee” checking account, which they don’t generally volunteer information about, but they usually have as an option. You basically have to tie up a hunk of money earning low interest in order to avoid the fees. I have now, multiple times at different banks, walked in, demanded a manager and said “How much do I have to have on deposit to get an account with no fees?” Eventually, they told me. I consider it the price of admission: worth it to get free checking, ATM access, free deposits of checks from third parties, ability to walk up and ask for rolls of quarters, etc. etc., with *no fees*. Ms. Yellen’s system doesn’t actually remove the need to have a checking account (due to routine everyday stuff like depositing checks, going to ATMs, buying rolls of quarters, and so on) so it’s still very important to eliminate banking fees from your life. They will nickel and dime you to death. I have Northwestern Mutual policies which are direct recognition policies. Is it possible to use these policies in a way similar to what you describe with non-direct recognition policies? You’ll find the answer to this question at /michael-kitces-misunderstands-bank-on-yourself-part-2.html, point #2. I love that even the money I have borrowed is still earning interest for me as though I hadn’t borrowed it. It is so simple to use and I am more than happy to “Pay myself back” for what I have taken out. I don’t lose the money at all. I don’t think 99% of most people and 95% of all certified planners understand the BOY concept. It’s troubling to me to read so called “experts” make comments about these types of policies. Clearly, they haven’t done their homework and they aren’t providing paying clients sound advice. Thank you, Pamela, for getting the word OUT about how this Bank On Yourself way of living can change your finances! I have 2 participating whole life policies with non direct recognition and am applying for a 3rd! The reason is simple. I get to control when I take money out, when I put money back in, and at a 4% =/- interest rate it is my BEST source of financing and extremely flexible. All the while, the underlying cash value just keeps growing and compounding whether or not I have a policy loan out. How amazing is that? I agree with the philosophy of USE it or LOSE it, so I continually use of the Bank On Yourself method for financing projects and purchases for our family. I love to watch the value of my policy grow and GROW! THAT doesn’t happen at a “regular” bank. Can I roll my Simple 401k into one of these? If you are interested in this strategy and would like to find out if you qualify for it and how you could benefit from it, given your unique goals, circumstances and dreams, why not take advantage of a no-obligation Bank On Yourself Analysis that will help you get those answers? You can request it here now. First, recognize that there is no tax-savings in the plan you have now. In my opinion, if I were you: 1) I would cease your current plan and roll it into a pour-over IRA. 2) Begin taking 72(t) distributions from the IRA. 3) Pay the taxes on the distributions. 4) Combine the after-tax remainder with the after-tax value of your previous contribution plan, and apply these funds into the properly designed Whole Life Policy. You will quickly build the BOY policy to loan usefulness, and you will have minimized the impact of Required Minimum Distributions post age 70. What is it going to take for many of these “mainstream financial experts” to understand and embrace the BOY philosophy? Is it more because they cling to Wall Street and all the financial education that were taught and what they must follow as a certified financial adviser? I started my first policy almost 5 years ago, and I am looking forward to starting a second policy very soon! Me K has an issue with your program an doesn’t take the time to read your website or book to get the correct information about the product. I have found that you can tell someone about this product and they will never get it. In 2016 I needed to purchase a piece of equipment for my business. I was able to get a loan very easily. No questions asked. I had the money in a few days. In 2017 I decided to add another piece of equipment. I didn’t have my first loan paid off yet, but it wasn’t a problem to get more funds from my bank on yourself plan. Again, in just a few days I had the funds. It’s nice to be able to get the equipment I need and to be able to borrow the money from myself. The whole concept just simply works. I have recently taken out a home equity loan and had to feel out much paperwork, get “Approved” and finally wait 30 days to receive My money. It was a bit frustrating. Hi, Pamela, You quoted me in your book. I funded my son’s college education by depleting a mutual fund first and then borrowing from a 401K at work. Well, the mutual funds are now all dried up and the 401k did not earn as much as it would have if the funds were still in it. I did pay back the 401K. If I had a BOY type policy(s), I could have borrowed from it or them (I now have three policies), they would have continued to grow, and now I would have more cash value and death benefit. Finding this out was the first time I said (out loud), I wish I had learned about BOY sooner. The second experience is one that probably more people can relate to. I bought a car in 2011 and took out a conventional loan to pay for it. After paying the loan premiums for several months, I had a real AHA moment. I looked at the loan value in my policies and determined I had sufficient value to borrow against one of them, to the tune of about $30K. So I did. I paid off the car loan and then started paying off the BOY loan. I eventually paid the off the BOY loan as well, But here’s the good part. Paying off a car loan to a bank, at the end all you have is the car. Paying off the BOY loan, not only do you have the car, but you also have the loan value back in your own policy to use again. It’s actually higher because of the policy dividend and the annual policy premiums increase the policy values, i.e. death benefit, cash value, and loan value. It truly is a win-win-win situation. Why didn’t I learn about BOY earlier. I am so glad I did, eventually. Oh, by the way, with the help of Aurael (my adviser), we are plotting future benefits since I turn 70 and a half this year. Can you say tax free retirement? We’ve had our BOY plan for 5 years; big believer in how it helps you when you need easy access to tax free cash. Taken out 2 loans to pay off other bills and buy my wife a nice Volvo SUV. It was a wonderful feeling to pay cash for a vehicle. It’s also satisfying to see our cash value and divindends grow! Look forward to teaching my two kids how to utilize this great tool for their financial futures. I used my BOY policy to buy tires for my car and a year later to buy an iphone. Both times I took my time paying myself back and didn’t stress out about owing a creditor! BOY is a super cool way to relieve unwanted financial stress and invest in your own future! Do any of the insurance companies who offer BOY policies do business in New York? Yes, Bank On Yourself is available in every state in the Union and in Canada. I have a four year old policy. I reduced my premium to just cover the benefit for more than two years. Man, I wish I did not do that because my cash value would have been so much more had I continued to pay into PUA’s. My loan outstanding is manageable with not much interest year to year. I wish to payoff my cars soon with another loan and pay myself back. My misconception about my cash calue not growing as fast as I wanted almost caused me to cancel my policy. Now, I understand that I did not pay into PUA’s and that is so important. When I divorced, I had difficulty paying my whole life premium so I took a loan from the cash value and the premiums were paid. Eventually I was able to pay back most of the loan but the good thing is, my policy has increased in cash value due to dividends. What’s more helpful is the loan interest is low enough and there are no forms to fill out or financial papers to provide. One of the benefits I like most is the peace of mind I have knowing that if I die, my beneficiaries will receive the face value of my whole life policy, minus the loan of course. I find it disingenuous that financial advisors like Mr. Kitces, Suzy Orman and their ilk dismiss permanent whole life as an investment and promote 401k’s of which even its creator admits is a horrendous investment. Who pays these so called “financial advisors” to misinform the american public to throw good money away on such bad advice? I have been close to purchasing a Bank On Yourself policy a number of times over the past 10 or so years but, like many others, have opted away from it each time. When I read the articles such as this one, it just seems to make sense yet when I have spoken with the Bank On Yourself advisors, it becomes more difficult to trust, especially with so many other “alternative financial advisors” presenting information counter to it. As the article mentioned, there is still the belief of many that the insurance companies are there to make a profit for themselves and this is just another avenue for that. The Bank On Yourself folks suggest the special Whole Life policy is the way to go, while others suggest that the newer IULs are better. Then the more “traditional” advisors push the “buy term and invest the rest” strategy. I said that I had opted out a number of times. Each time, it has come down to the cost of the policy vs the accumulated cash value which as it has been explained to me by the BOY advisors is what you can use when taking a loan. Each time I have looked at the policies (and because I am older each time), the amount of time that it takes to build up the cash value to make it useful takes longer and longer. That is, unless you have a huge bundle of cash available initially to plunk down. I believe that the BOY policies may be a very good approach but, in my opinion, when many people begin to investigate it, their experiences with other insurance companies, be it life, auto or home, overshadows their decision to start a BOY policy. I’m not sure how to change this. This is very overwhelming to me. I’m not sure if I have the available funds to start this process. Our Bank On Yourself Authorized Advisors are often able to show clients how to restructure their finances to free up more cash flow to fund their policy, without having to pay additional money out of their pocket. You can learn for sure by requesting an Analysis. In the past I’ve been advised not to buy a whole life insurance policy for a variety of reasons. Everything I’ve read about Bank on Yourself so far makes sense! This article really helped continue to help me understand — especially taking a load out again your insurance value. With teenagers and another car purchase looming in our near future, it makes sense and “dollars and cents” to fund it through a BOY loan! Seems like a win- win situation to me! Thanks! Pamela – I first met you back in the early nineties and still have your tape sets “Simple Selling” and “Stay Out Of The Cold”. You were a wonderful resource then and I am glad you have taken up the mantle for whole life. The unfortunate side of it all is our country is terribly inflicted with confirmation bias. People seek out information that confirms what they already believe rather than researching a topic from information they gather from multiple sources and making their own decision. We need your continued advocacy. Keep up the good work! Every month I get these checks in the mail from my various credit cards encouraging me to use them for all kinds of things. Using the checks means I’m taking a cash advance against my credit limit. It’s a loan. I’m even told that I can transfer other credit card balances and pay 0% interest for a promotional period. That sounds great doesn’t it? Well one day I read the fine print on one of those checks. What I learned was that yes, the interest rate on the transfer balance is 0% for a period of time. But what this particular credit card does if you use the check is that all purchases now incur interest from day one. So even if you pay your balance in full by the due date, you’ve incurred interest on all those charges from the moment you made the purchase. In other words, no grace period. Imagine the shock you’d get to see all those fees and charges even though you paid off the card balance! Contrast that with the Bank On Yourself system where you can take a loan against your policy. I’ve done this a couple of times. Not long after I first started my policy, I took out a small loan to buy a laptop computer. It didn’t take long to pay back the loan and all the while, I was still earning interest on the full cash value, as if I never took out the money in the first place. The cash value in our policy has continued to grow and recently, my wife and I decided to do a major landscaping improvement on our house. We could have taken out an equity line to fund the work. But that just gives another creditor an opportunity to take my home if something happens and I’m not able to pay the loan back. Or perhaps we could have gotten a cash advance on our credit card. We’ve already seen the disadvantages of that strategy. Instead, we borrowed against our policy. The process was incredibly easy. There were no long forms to fill out and no invasive questions about what we were going to do with the money. Within a few days, the money was just there, in our bank account, ready to use. We’re currently paying back this loan at our own pace, with comfortable terms that we’ve set up ourselves so that it doesn’t adversely affect our budget. What other lendee will let you set the terms for paying back a loan? Simple answer is NOBODY. And all the while, our cash value is still growing as if the full value of the policy were all still there. This is the exact opposite of what your credit card wants to do for you. If you take out a cash advance, they want to charge you interest from day one on purchases you make even if you are in the habit of paying the card balance in full every month. So you incur fees anyway! What sounds better? Paying fees on money you pay off right away (credit card loan), or still earning interest on money you’ve borrowed (Bank On Yourself)? No, Mr. Kitces, borrowing against your Bank On Yourself policy could not be any more different than borrowing against your credit card. Yes, they are both loans, but the difference is in the details. To equate them as somehow being the same is like saying there’s no difference between football and baseball because they are both sports that you can play or watch on TV. While in college I lost my job mid semester. As some of you may appreciate, finding a job mid semester in a college town is difficult. As a result my young wife and I found it difficult to pay our credit card bills. It took a lot of calling, hassle, and graveling to get any temporary relief from our obligations while I looked for work. Many years later, I found myself in a similar boat. This time we had six kids, higher rent, and many other expensive. Again, I found myself unemployed, but this time I had a Bank on Yourself policy. Within a few months it became obvious, this would be a longer than expected period of unemployment. To survive, we simply contacted our BoY agent, told them we needed to borrow from our policy, but also, we let them know that we needed to stop payment against the sum of our loans for a few months, including the new one. Can you imagine, going to your bank, asking for a loan, and telling them you will stop payment on existing loans, including the new one, for several months. Not only would the answer be NO! But they would probably look at your mortgage and everything else about you as high risk. But, with BoY, within a few days the money was placed in our bank account and we were simply paying the minimum to keep the policy going. Once I was back on my feet, we renewed our payments at a rate we choose, and once again began to grow our policy aggressively. I say aggressively, because, while I wasn’t paying the loan, as also mentioned in the article, my policy was still growing. Win, Win, Win. Very interesting but, I do not have life insurance of any kind. The results are to generate volume and velocity of money with 100% of the control and, when done correctly, zero risk – All under the bank’s control. Inherently, isn’t this what everyone is looking for – the ability to utilize, grow and control money throughout life without uncertainty, loss and risk? “Investors”, including most financial professionals (I can say this with confidence because I was one for many years), are never taught to THINK like a bank. They/we are educated by investment firms, credentialed by investment firms and government agencies designed to control investments, and promote primarily investor products and thinking…all that ultimately transfer control of money away from the individual and into the hands of the financial institutions and government. The risk is also all borne by the individual, hoping that their ‘advisor’, strategies and vehicles will perform. IF the ‘investor’ mindset and strategies truly performed as touted, why is it that SO many highly educated and motivated Americans are no where near they want to be financially? Maybe…what we’re taught to think and do isn’t all that good…for us! Once I learned how to THINK like a bank I wanted the same results banks have historically created. At that point, the only question became, “What is the best vehicle to generate my desired results?” If it was mutual funds, stocks, real estate, investing for the long term, laddering CD’s, maxing out my 401(k), or even buying 100,000 red solo cups…I didn’t care! I wanted the lifetime results and the knowledge base to understand WHY the vehicle would provide the results regardless of the economy. The other part I love about this strategy and vehicle is when I identify other ‘investment’ or ‘banking’ opportunities, I know my ‘bank’ provides the proper foundation to enhance every other financial opportunity available to me. When I use the funds from my ‘bank’ to make money elsewhere, the same dollars grow twice or multiple times. If I lose money in another venture, my original dollars (borrowed from my bank) continue to grow and compound….by design…by contract…all under MY control. When educated properly to THINK like a bank and with a properly structured vehicle in place, the results simply have to occur. Why make it any more complicated than it needs to be? To those still looking and becoming educated on growing and controlling money and wealth, my biggest piece of advice is to learn to THINK like a bank and realize the lifetime results that thinking produces. To those financial professionals doing the same, I say this with love – GET OVER YOUR EGO’S and what you ‘think’ you know. IT’S NOT ABOUT INSURANCE!!!! It’s about living a life of control, growth and results. A properly structured whole life policy, from the right company, with the right components, designed for YOUR situation and goals, provides the results better than any other financial vehicle available. …and if I find something that works better…I’ll use it…and let Pamela know too, lol! I’m sure she’d be open to learning. Re: Whole Life, the saying goes, and I’ve seen many of the listed comments say the same thing, “if I only knew then what I know now !” Well I knew then what I know now and I still didn’t think ahead. I’m 62. Too late for me to ‘Bank on Myself’? Don’t let age or even health questions stand in your way. Make sure you work with the right professional experienced in the concept and properly structuring policies. Then you can make educated decisions. Neither age and/or poor health are necessarily obstacles. What matters is only that you CONTROL the policy and the equity in the policy, NOT that you are the insured. You could have anyone that you have an “insurable interest” in be the insured. Typically this could be a member of your immediate family, such as your spouse, a parent, a child or a grandchild, or a business partner. This is also something many older folks like to do for their children and/or grandchildren to help them build financial security, fund college educations, buy a house, etc. To learn more about those programs, check out these two videos and transcript. Typically the term rider is put in place to increase the MEC limit so you can ‘deposit’ more money in your policy. When the term policy expires, you shouldn’t need to continue it for the policy to perform, unless you want to. I don’t plan on renewing mine, especially since the premiums for term life do not build additional cash value or receive dividends. Check with your agent. They should provide good counsel. Thanks Mike, I have spoken with my advisor and he has brought me up to speed on understanding my policy. Once again Mike thanks your response has been helpful. The term rider is typically added to most Bank On Yourself-type policies to maximize the growth of the cash value, and it is often convertible to permanent life without evidence of insurability. You should discuss this with your Bank On Yourself Authorized Advisor. If you need their name and contact information, please email your full name and state to info@bankonyourself.com, and my team will send it to you. Thanks Pamela,for your quick response to my recent question.I have contacted my advisor and he has brought me up to speed on my understanding of the term life policy rider . Once again thank you …. I stumbled on to “Bank on Yourself” about 2 years ago. After reading many articles and books (which includes your book), I decided to reach out to your website and get some more information. I was paired with these awesome ladies in Texas and they answered all of my questions though many phone calls and email. I then decided to take a chance and get a policy since I was looking for additional insurance anyway. THIS WAS ONE OF THE BEST DECISIONS I HAD EVER MADE! I took my first loan out to purchase granite countertops. I love this opportunity. I am planning to put more of my funds into my bank! Thank you Pamela Yellen.. You changed my life! I teach a personal finance class to high school seniors and I use these articles with some good youtube videos to try and show the benefits of these policies. My students have all had their economics class and I talk about opportunity costs when taking money out of savings and the loss of interest compared to the policy loans and the fact that the value grows as you borrow against it. I previously thought TEAM LIFE was the best water to go , but after reading about this I have changed my mind. What is so compelling is the 160 Year Track record of these Dividend paying Whole Life policies. The opportunity to say good bye to the Wall Street Casino is interesting. Like many have said- it’s a jungle out there when it comes to advice! I’m now in mid-life, having done the 401k game and watching money be lost. Also, savings just sitting in there earning pittance. And some IRA’s, yes, those are tax free when you take them out at retirement but, that money is locked up for years- and frankly, it might be another ‘scam’ from the government to get what they WANT, not what’s in the consumers best interest. I also agree with many here, it’s hard to know if BOY is the best strategy or others who cry that UIL’s are better. Most of, even if we do study financial logic, can’t understand the rhetoric as they make it so confusing. I read money blogs regularly, especially ones that talk about paying cash for homes, projects, vacations. I haven’t paid cash for my home, but I do pay cash for everything else. I tend to lean towards this camp. But, if BOY is what it says it is, then I can see that it accomplishes the same things that the ‘pay cash for all’ camp does and more. I just haven’t felt right about which camp to join yet….but I’m starting to lean heavily to the BOY camp. Excellent discussion of the shortcomings of many financial advisors. 1). Ease of access to my money. It really is just one phone call away. My only decision is whether to have the loan money wired to the bank($10 for wiring fee), or get a check via snail mail. 2). My two children learn the essence of how banks work, and even more important, how to be a responsible borrower. Bank. It is truly Liquid, Accessable, and Working for my money. I have had boy policy for 5 years now. I have taken out 3 loans. A simple phone call and money was in my bank in less than a week. I wish I had read this in my twenty’s 🙂 But, here I am almost forty-nine with a very small retirement. This article is filled with useful information. At the most basic level, I didn’t know you could take out a loan on an insurance policy. The fact that with the right insurance policy the cash value keeps growing after you have borrowed against it. You don’t need to qualify for the loan! You just need the cash value. I must add that I am not well educated when it comes to finances. Here is a BIG thank you for making BANK ON YOURSELF understandable. Peace of mind! That’s the ultimate benefit I derive from having two properly structured participating whole life policies. I bought my first policy 7 years ago and my second 5 years ago. The cash value has grown to $250K and I now operate my own bank. True financial freedom feels great! My life insurance statements are the only ones that don’t create some element of anxiety when I open them. My wife has a convertible term policy and we’re preparing to convert it to whole life to open a new branch of our bank. If your whole life policy company doesn’t advertise that their policies have loan capabilities, would the BOY concept still work? It depends on the company – you’ll need to check with them and also find out if their loans are non-direct recognition loans, so you receive the same dividend even when you have a loan outstanding. I have a BOY policy bought later in life (52?) and have used it first pay back credit card debt from a bad marriage and consolidate loans, then purchase a truck. The process is seamless, fast and my only regret is not knowing about this earlier in life. I am telling my two stepsons about it. If you start this young, it could be your retirement vehicle. I started paying me back a couple months after I borrowed the money and love the ability to skip a payment if needed, although I haven’t. For those of you that haven’t done this, do yourself a favor and research as much as you need to to get started. As you’ve seen the testimonies, many of us wish we started earlier. Get an advisor, read the book, keep the article nearby, print the info, set an alarm to call and get an advisor; do anything to entice you to look further into it and take action! You’ll be pleased you did. The younger the better, you’ll find yourself with more than one policy. Your life will be financially easier, you won’t have to worry as much about money. You’ll be happier and smarter!! the 7 year period because that is usually the time period that these policies start to take off. Thanks Mom! I am 58 I started a BOY on my self 5 years ago for retirement planing . Then later an other out for my wife . Before my first BOY my Wife cosigned a student loan for my oldest daughter . So we decided to take a BOY account on her , incase the unthinkable would happen . Now the WL. account has grown a lot more than the student loan ( which does give one peace of mind ) My daughter is now Married . I plan on giving her this account and my advisers name ( He and his staff treat me as you would your best of friends ) All my daughter and her husband have to do is swap money equal to the cash value of the BOY. This is a Win Win. Its their money buying their money and Life insurance ! They will get an established account that can be redesigned to their life and plans now. All for no interest . All good things take time , but well worth it. These past 5 years have gone by fast. I took to the BOY concept like a duck to water because I had experience with the concept (sort of) prior in my life. When I was young, my oldest brother passed away in a vehicle accident. My parents at the time were unprepared for the funeral expenses, so when my brother’s estate was settled, they used a portion to open a 20 year pay $5000.00 whole life policy from Woodmans Life Insurance Company in my name as a “just in case”. After I graduated high school, I took over payments of the then nearly paid in full policy and found a pleasant little bonus–the option to take loans against my own money! The ability to use those funds in those early years for purchases like school books, unexpected vehicle repairs, you name it, and pay it back on my schedule was a financial life saver on more than one occasion! So when I first ran across Pam’s book nine years ago, it took me little time to realize a BOY account was right for me because I already had experience with how it worked! I have now successfully used my BOY account to purchase two new-to-us vehicles, various upkeep repairs to our acreage, and am currently bankrolling TWO daughters college tuitions. There is no way I would have been able to swing that if I was tied to a bank’s payment schedule! The flexibility that BOY offers for ME to decide my own payment schedule is a life saver. I can sleep much easier at night knowing my initial funds are still working for me and the only collector I need worry about is sleeping in my own skin! If you are self disciplined in your money management, a BOY account is THE way to go…. ….and yes, I wish I had known about BOY back when I first started working! This would have been great if my parents were able to teach me when i was younger. This is what a i call a bit of education. Would we say a teaching moment? I think so. I like the idea that you can borrow at very competitive rates and still have your money working for you earning dividends along the way. Also, no “qualifying” required, just make a request and your money is on it’s way. Pay it back on your terms! I’ve read your book. I’ve always been anti-whole-life but you have my attention. It would appear that Mr Kiche is just so smart that he has lost his common sense!!! I have a lowly BS degree and I can see all the value in BOY. In fact, I have only had an account since 2013 and I have already borrowed money from my account. This summer we had a very bad hail storm in our little town of Killdeer and I had to borrow some money for repairs. Thank you BOY for being such a good value!!! Great info on your website. I’ve been nothing but impressed with this Bank on Yourself system since we started the program. It’s nice to pay off other loans with our insurance loans but continue to see our money keep growing in the Bank on Yourself system. My parents began 3 small dividend paying policies before I was 18. At age 23 I was responsible for the 600 premium. That’s when I “got educated” about the tremendous gift my parents started for me. Those policies have been a source of capital over the years for car purchases, home down payments, vacations, taxes due, college education for 3 children and now possibly providing tax advantaged retirement income. Of course, I’ve added to my program over the years and it gives me a great sense of peace and comfort knowing capital is always growing tax advantaged and the death benefit will be paid someday. Ive seen low inflation, high inflation, wars, economic growth and downturns. The policies have been the single best thing Ive done with my money. This piece of financial property is miraculous because it is applicable and useful to so many of life’s financial challenges. And I paid the premiums every month for 40 plus years. I feel good about that. I LOVE Bank on Yourself! That’s why we have 4 policies! We have borrowed against our policies to pay cash for an Infinity QX56, a BMW 750LI, and property in Maui. We get to pay it back at our own pace, or never….or just pay interest…in other words WE DECIDE what we want to do! It’s like owning your own bank! Plus we borrow at 5% and our dividends paid 5.1%….so if you do the math, how can you get a better program than this! And on top of all that, we have a life insurance policy in place God forbid something happens! So why in the world wouldn’t everybody have BOY policies in their portfolio?? Thanks Pamela Yellen for the great knowledge, and thank you Teresa Kuhn for being such a great advisor and friend to our family! Since I had heard about the BOY program, I noticed how financial “advisors” like Mr. Kitces, usually had more negatives to say about it than positives, and, would “begrudgingly” admit that the BOY program is a program that would work for ANYONE! I don’t have much else to say about why SOME advisors, or even agents don’t learn more about the HOW and the WHAT FOR about Life insurance! BOY, simply keep doing what you’re doing, because it makes sense, and it is a GOOD product/service!